Alternatively string onto the skewer a piece of bell pepper, meatball, pineapple, meatball, pepper, meatball, and pineapple. Continue until all meatballs are skewered. Place on a baking sheet, brush lightly with sweet and sour sauce and bake for 15 minutes. 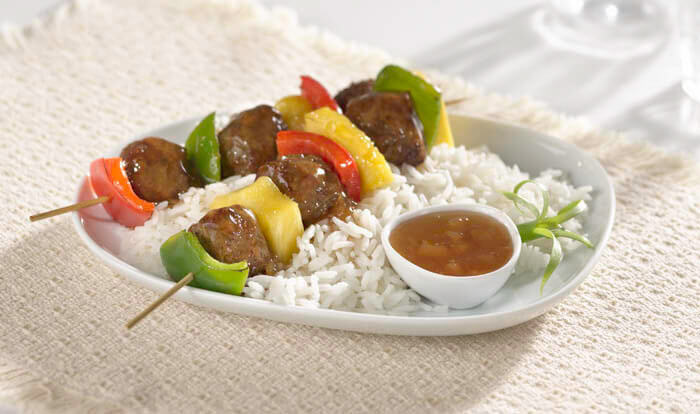 Serve skewers on a bed of warm rice and drizzle with warmed remaining sauce. Have a favorite marinade or sauce? Try using BBQ sauce, Jerk grilling sauce or Peanut Sauce as an option.